Happy Father's Day! Summer's Almost Here! Happy Father's Day coming up and Summer is just around the corner. With some of the temps we've had it seems like it's already arrived! The kids are out of school for the summer! We now how a senior in collage (who will probably go another year to get a teaching certificate), a senior in high school and a sophomore in high school. Man how time flies!!! We've been pretty busy around here so I haven't kept up with my blog like I should. Just to much to do. 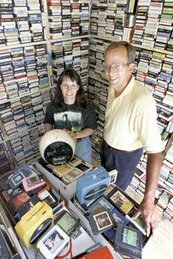 Out buying lots of 8-tracks (just put up a new list today so check it out - http://www.katestrackshack.com. If you're not sure what to get dear ol' dad - we gift certificates and lots of tapes on sale! We went to Jefferson, TX last weekend. Lots of antique places to shop. I've talked about this place in previous blogs. It's about 3 1/2 hrs. away. We've gone before when a lot of the shops were closed and it was raining. We got a few cool things like bubble gum cigarettes for the kids (not really kids anymore, who am I kidding!) and some other fun candies. We bought a vintage window pane for one of our girls and a vintage camera for one of the others. They were having a health fair and as we walked by (about lunch time) they invited us to have free hot dogs/sausage, chips and tea. You can't get to much healthier than that! I think they were hoping for someone to have a heart attack on the spot so they could treat them on the spot. Dan is also working on the Amphicar (boat car) and the jukebox. Just ordered up a bunch of parts for both. There goes money for a tablet! Sold Harold on Monday. Sorry to see him go. I hope the new owners treat him well. We're down to 7 (had to think about that for a minute). Probably off to the car show here in a bit. Don't think we have anything really to take. Maybe the '65 Chevy Van? Better get off here and get the house cleaned up before the weekend. Not sure what we're going to do this weekend, but I did get us tickets to see 1964 The Tribute (a Beatles Tribute band) for early August. We saw them last year and they were really good. We're taking some friends and our girls.